Brent crude closed down 2.8% yesterday at $59.93/bl while WTI closed down a bit more violently 3.2% at $51.99/bl. A 0.8% decline in the S&P 500 was a bearish guiding force for the oil market which has traded more or less in lock-step with equities for a long time now. A bearish US rig count last Friday (+10 w/w) also lingered giving the market a bearish flavour. Rising international support for Juan Guaido in Venezuela and now also US sanctions towards PDVSA has increased the chances for a regime shift from the current Nicholas Maduro regime with a possible revival in crude oil production in Venezuela thereafter. We think that such a revival in crude production is not around the corner and that it will probably get worse before it gets better. We would be surprised if Maduro steps down without resistance. Our Brent crude oil price forecast for Q1-19 is $55/bl but so far in January it has delivered close to $60/bl. Our call for $55/bl in Q1-19 is integral for our price forecast for the rest of 2019 because the Q1-19 price will set the pace of US shale oil production in Q1 and Q2 2019 and thus the production base also for the rest of 2019. We are forecasting a softer US shale oil production growth in 2019 but that requires a softer crude oil price. Especially at the start of the year. The US oil rig count on Friday was somewhat sobering as it bounced by 10 rigs w/w to 862 which is just 16 rigs shy of this cycle high of 888 rigs. What it showed was that as of yet the lower oil prices since early October has not really dented the appetite for shale oil drilling to any significant degree. The US EIA Drilling Productivity report in January gave a bit more ground for optimism as it showed that well completions in December fell to 1,211 wells from a cycle high of 1,322 in October. Our current forecast is for Brent crude to average $55/bl in Q1-19 and US shale oil well completions to average 1,000 wells/month in Q1-19. But the latter will probably not materialize without the first. The oil market is currently strongly driven by the sentiment and direction of the S&P 500 index. US investors are focusing on US equities, US oil inventories, WTI crude oil curve price structure, US shale oil activity and refining economics. At the moment refineries are losing money by making gasoline. US shale oil rig count has not yet fallen to any significant degree. US oil inventories have spiked by 90 m bl over the past half year and with much of it over the past month or two. 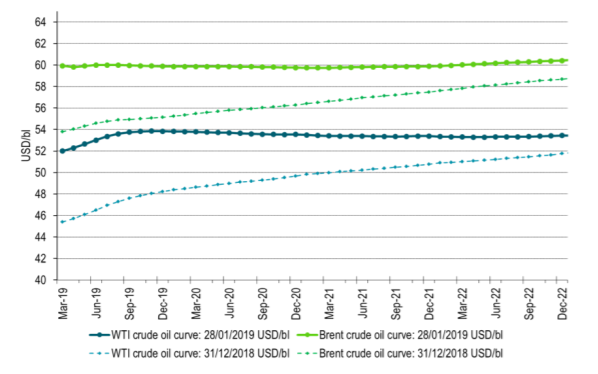 The WTI crude curve is naturally in contango. The Brent crude curve is however close to flat as OPEC+ is tightening up the global oil market. As such the focal point of the oil market now is S&P 500, WTI and shale oil and from there it reverberates out to the Brent crude oil prices. We have seen a very nice rebound in the S&P 500 index so far this year but the weakness over the past week has led the Brent crude oil price lower. On Wednesday we’ll have US GDP data for Q4-18 and we think there is a significant risk for a disappointment which naturally would be bearish for both the S&P 500 and crude oil. As of yet we have not seen a satisfactory reaction of lower activity in US shale oil drilling and completions as a result of lower oil prices since October 2018. 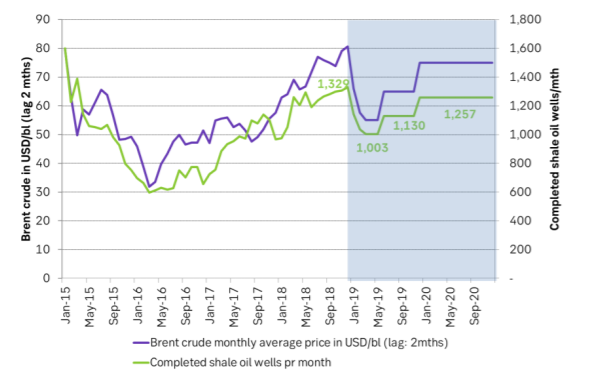 In our view crude oil prices needs to move lower during the first part of 2019 than where prices are at the moment in order to secure a satisfactory oil market balance later in 2019. 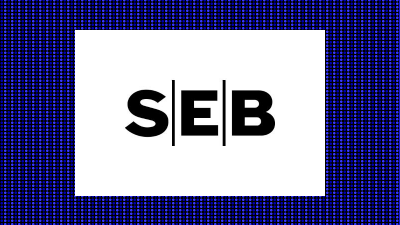 Ch: SEB Brent crude oil price forecast together with SEB US shale oil well completions forecast. 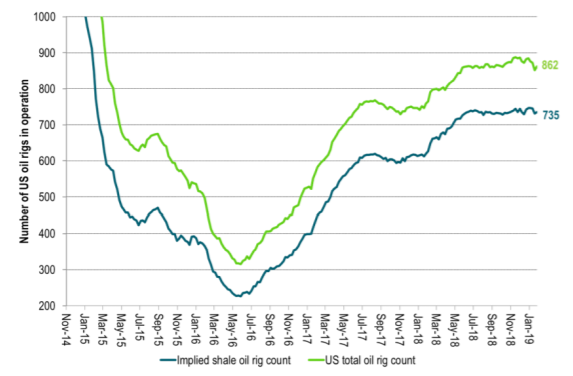 Ch3: US drilling rig count is only off 16 rigs from this cycle high. Not much reaction yet.